So I messed up my first go at week 12, about 3 days in – complete disaster – and decided to call it a holiday – mentally I just needed a break. So I started again this week. There is something in the threes for me – I seem to hit hard patches – three days, three weeks and three months. I have been feeling a bit off colour the past 2 weeks as well which has not helped. To keep it simple I just tracked the exercise – every session done – Friday at a reduced pace because it was all I could to do drag myself anywhere near the treadmill! After much procrastination today’s session was finally done on incline, walking instead of run/walk on the flat, just couldn’t face the more jarring form, – made sure the effort was the same though, enjoyed the change – wondering whether I should incorporate some incline walking. It’s been a funny week this past week and I must confess to some emotional eating. This recession really seems to be bringing out the worse in some people at work. I really am so tired of office politics, unethical people who will step on anyone to achieve their ambitions, workplace bullies and feeling powerless to do anything. This is not happening to me directly, it is happening to my partner, who comes home every night in a thoroughly dejected state because of their current work environment. I just don’t know what to do. Watching someone I love so much, someone who is capable of building so much and who is especially talented at turning negative situations into positives, but who is now losing self confidence and is too afraid to move/talk for fear of repercussions. Given that the organisation being worked for is there to empower their clients it utterly astounds me that the culture that the employees work under is one of fear and blame, plus there is a now ever present threat of job loss. Work colleagues who profess to be friends will stab each other in a back as soon as look at each other. Horrible – whatever happened to loyalty and having each other backs. While it is a difficult situation, for the most part I try to block the feelings I have about this out – I do not want it to colour my outlook – I have so much to be thankful for and some amazingly kind and generous people in my life. Just a shame about the a***holes. With that in mind the exercise sessions have felt like a positive diversion and a step forward this week – and as such easier to do. I am now working at increasing my times and varying the lengths of the sessions – hoping to get to four and a half hours per week in the not too distant. Despite the emotional eating I did achieve a small weight loss (500g) which is encouraging after feeling stuck over the past few weeks. It’s amazing how 5 minutes extra exercise can do my head in. I am seriously grumpy. 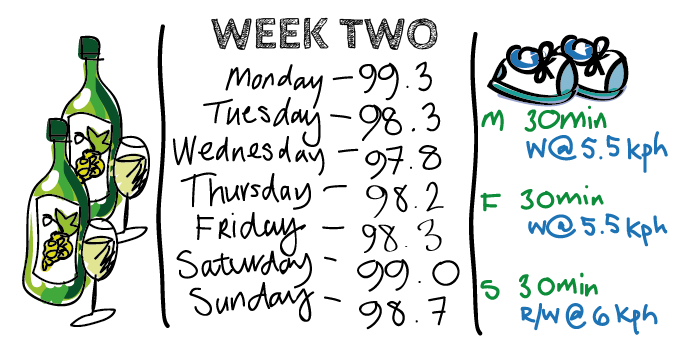 This week I increased 3 sessions by (only) five minutes and I found myself mentally fighting the new time… hating every extra second – it felt like forever! This is the price to pay for years of doing lots of wrong things, I am now dragging myself kicking and screaming like a 2 year old, back down a long slow path towards fitness, and I am not happy about it at all. Well I heard the expression “Harden Up Princess” this week and It spoke to me… so onward to week 11 with further increases in times. Grit teeth and move ahead. My work commitments are full on this week so I am just going to focus on getting the exercise sessions done. I have been unsuccessful yet again in cutting the weekly smoking session out but I am noticing the benefits of less wine and cigarettes which is great. Last time I was running a lot I found that as my exercise times increased my desire to smoke disappeared naturally and wine started tasting like poison and I stopped both about halfway through training for a half marathon without really trying – maybe that is what I should do – trying to force it is not working. Week Nine – found muscles in legs! Week nine felt kind of uneventful really so I won’t bore you by rattling on. Did my five exercise sessions – no problems with hip this week, so will increment by 10% (15 min) next week. Blew the not smoking by Wednesday. EXCITEMENT… Found some wee running muscles developing under the fat! YES! A sore hip meant I was unable to complete two of the treadmill sessions this week. Not quite sure what I managed to do to cause the soreness, at first I thought perhaps I had slept funny, then I decided maybe it was old age and a sign that I was finally on the road to falling apart. Anyway a few days rest and the soreness has gone, with only a slight niggle – so with that I decided to get back on the treadmill today as planned – will see what tomorrow brings. Managed to keep the cigarettes at bay, despite some very bad news on the work front for my partner – which will more than likely leave us without any regular income for a while. Very scary… so there have been times when I could have absolutely murdered a cigarette over the past week. Food was ok. I seem to start the weeks with a hiss and a roar, happily eating tuna and salads, and drinking water, but by Thursday I get bored, graze a bit more and want cheesy pasta stodge, Mmmmmmmmm. From last week I am down 3.1kg. Need to make some better progress with the weight loss if I am to start increasing the exercise sessions. Other cool news… I am very lucky to have finally found a training buddy – she is a good friend who lives a few hours drive away who wants to improve her fitness also. We have set up a small private Facebook page so we can keep tabs on each others progress and motivation. Until now I have always kept this stuff to myself, my partner or shared with people I don’t know (eg WW groups) so this is really different for me. Despite my general reluctance to ever ask for help it has actually been a relief to finally share it with some one I know and trust. Nice feeling. 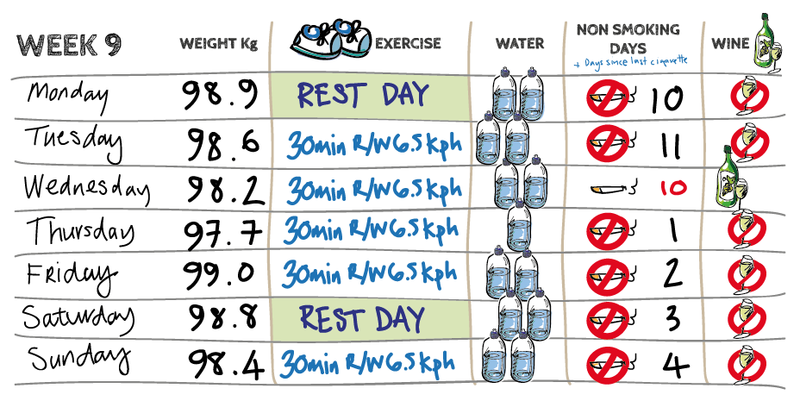 Well I achieved all 3 goals with somewhat depressing results (with the exception of one bottle of water on Saturday) – weight gain! Friday night drinks proved too irresistible so I only managed 6 out of seven days without cigarettes. Felt lousy the next day so will try to resist the urge with more determination this week.The up side of not smoking is that the water is easier to drink – I associate smoking with coffee and tea so have been replacing these drinks with water instead. As for the weight gain, the most likely culprit – evening meal carb intake and snacking after dinner so… I need to focus on reducing these. The 4 treadmill sessions went without a hitch – no knee soreness, so I will be picking up the pace soon. For the last 10 percent (3 min) of each session I like to increase the speed by .5kph – my reasoning – if I can’t pick up the pace a little at the end I am going too fast for my fitness level, and to see how I feel going a little faster so I can judge when to increase the speed of an entire session. I am fighting the urge to go faster too soon, and have decided it’s important to allocate the time and get into the routine of commitment to exercise first – without dreading the thought of having to do it by making it too hard. At the end of week two I have successfully completed two out of the three goals. 3 x 30min sessions completed and I am 3/4 of the way through “No Need For Speed”. As for the wine – well I knew this might be a tough ask this early on so again 2 bottles of wine over the week – not exactly an epic fail but still not where I want to be. Given that this is the week before Christmas I suspect I will not manage it this week either – so I might postpone this to the following week. Considering I used to cringe taking the recycling out for kerbside collection I’m not doing too bad – it’s pretty lame when you find yourself hiding the wine bottles under the plastics and newspaper so the neighbours wont see! Weighing in seems to be working – I find myself checking in a little more to see if I really am hungry before I beat a track to the fridge or pantry – another 900g down (from last Sunday) so now a total of 1.8kg lost without it feeling like a diet. Still enjoying the evening mint/choc treats. The first 2 sessions on the treadmill I just walked at a pace enough to develop a light sweat by the end. With the third I used a bit of a walk jog kind of motion which felt good – while it may not be running it feels more like it, a little harder but it was easy to maintain for the whole 30 min. I think I will aim for this pace for next week’s sessions. I am very aware of the need to progress slowly, my knees are certainly noticing the extra movement and because of the extra weight I am carrying – it will take a while for the muscles around them to strengthen again. Reading has been great for the head space. Left my last treadmill session till this morning and was not feeling terribly motivated, so got up made a coffee and returned to bed to read a couple of chapters before I found my get up and go. Sometimes the hardest part is just putting my running shoes on. As for next week I will continue weighing in – with Christmas day in the mix there will be more than the usual amount of temptation around so it really is about minimising damage! 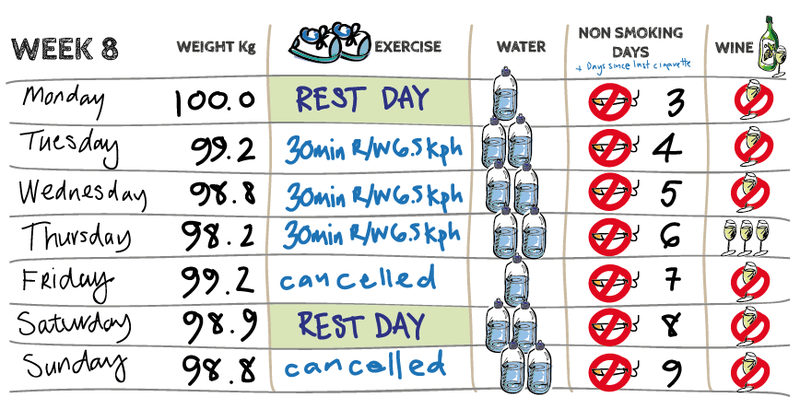 Drink more water (aim for 2 x 400ml bottles) each day – just for the record – I fill the bottles I use from the tap!